Jews began to arrive in Laurel in the 1890s and many of these Jewish residents of Laurel traveled to Meridian for religious services. By 1900, enough Jews had arrived in Laurel to form a minyan. As the Jewish population grew, they gathered to worship together in private homes for lay-led Orthodox services. In 1903, the congregation acquired their first Torah. This town in the heart of Mississippi’s lumber industry continued to grow, and the Jewish population was continually stregnthened by the arrival of new workers. Several of these new arrivals were commited to the civic growth of the town and to the advancement of their religious community. In 1906, Laurel Jews formally chartered their congregation, naming it Knesseth Israel (“Gathering of Israel). Its charter members were D.B. Pollack, Abraham Marcus, Phillip Lefkowitz, Nathan Weinberger, and Jake Kastleman. At least four of these five were immigrants from Eastern Europe and retail business owners. Two were tailors, one was a shoemaker, and the other was a dry goods merchant. Lefkowitz was the first president of the fledgling congregation. In its early years, the congregation was Orthodox. Since most of the members were immigrants, the congregation kept its early minutes in Yiddish, their native tongue. Unfortunately, these early records were lost in 1922. The members of Knesseth Israel moved quickly to build a synagogue. They received incredible support from their gentile neighbors, who reportedly donated the large majority of the money to build Laurel’s first Jewish house of worship. On September 5, 1907 dedication services were held for the new temple, located at the corner of Fifth Street and Sixth Avenue. The ceremony included placing the Torah scroll in the Ark, a prayer by Rabbi Jacob Kaplan of Selma, Alabama, a sermon by Rabbi Max Raisin of Meridian, and a Choir performance of “Guide Me O Thou Great Jehovah.” The congregation invited Reverend L.W. Rose from the Episcopalian Church to speak about the history of the Jewish faith and Reverend R.L. Campbell of the Presbyterian Church to address the relationship between the Laurel Jews and Christians. Reverend Rose declared that members of the congregation should be proud to be Jewish and that he would proud if he had been born Jewish. He also noted that both Jews and gentiles serve the same God. Reverend Campbell of the local Presbyterian Church congratulated the congregation on its new building. The service lasted two and a half hours. When the synagogue was built, the congregation also formed a religious school under the direction of Mrs. A. Lefkowitz. In 1910, the congregation sent delegates to Meridian for an annual convention held by The Jewish Religious School Teachers of Mississippi, designed to improve the quality of Sunday school instruction in the state. The school was never very large; at its peak, it had 35 students. 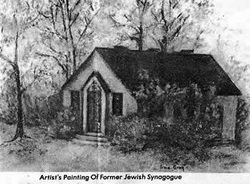 Laurel Jews also established a B’nai Brith Lodge in 1908 and a Temple Sisterhood in 1915. The sisterhood had 25 members when it was formed, but declined soon afterward. In 1931, it had ten members, and it disbanded in 1971. In 1917, the Congregation purchased a plot of land to be used as a cemetery which they named the Knesseth Israel Cemetery. Laurel never had a large enough Jewish population to hire a full-time rabbi, so they relied on their neighboring congregations for rabbinic services. In the early days of the congregation, they sometimes received services from the full-time rabbi who served the Meridian congregation. As populations shifted, however, Laurel entered into an agreement with Hattiesburg to share a rabbi, who lived in Hattiesburg, but visited Laurel regularly. Founded as an Orthodox congregation, Knesseth Israel was split over whether to introduce elements of Reform Judaism. One faction wanted to maintain the traditional practice while another group sought to change. According to a member of the congregation writing in 1931, “there are not enough of either [faction] to pull itself away in an absolute assertion of its position. With the house divided, nothing at all is accomplished.” By 1940, this dispute had been resolved, and Knesseth Israel officially embraced Reform Judaism. In 1927, the temple changed locations due to a real estate trade. Eastman-Gardiner wanted the land to build a hotel. In exchange for the land, the Laurel Jews were given a new plot of land on Fifth Avenue and Eighth Street to construct a synagogue. For several years, they were without a building. In 1931, they built a small brick building that was intended to become an education building once the congregation grew large enough to build a more substantial synagogue. That day never came, and the congregation used the small building for the rest of its existence. The congregation continued to hold services in this temple until 1969, at which point too few Jews remained in Laurel to maintain a congregation. That year, the building was damaged in a railroad car explosion, and the congregation decided that it did not have the money or the members to repair it. In 1970, the building was torn down, and donated the furnishings from the old temple to two African American churches in the area. In 1973, the congregation sold its lot and placed the profits from this transaction in a Knesseth Israel Charitable and Educational Trust Fund, which distributes money to 25 worthy causes. “First Jewish Services Held Here in 1901.” Leader-Call Centennial Edition, May 11, 1982. “Historical Abstract of the First Thirty Years of Laurel Jewry.” American Jewish archives. Laurel Mississippi file, Institute of Southern Jewish Life archives.